Seven Lions Returns to Atlanta, 26 November, Pledges Part of Ticket Proceeds to Cancer Org. It's easy to make such a definitive statement, because Seven Lions came to Atlanta three times in 2015. Well, Seven Lions is coming back to show Atlanta some love again -- this time at The Tabernacle, 26 November 2016 -- and this show will have an extra special meaning to it. Seven Lions announced he's teaming up with FCancer, a cutting-edge nonprofit organization dedicated to early detection, prevention and providing support to those affected by cancer. In addition to general awareness efforts being present at his Atlanta show, one dollar will be added on to every ticket purchased and the proceeds will go directly to FCancer. 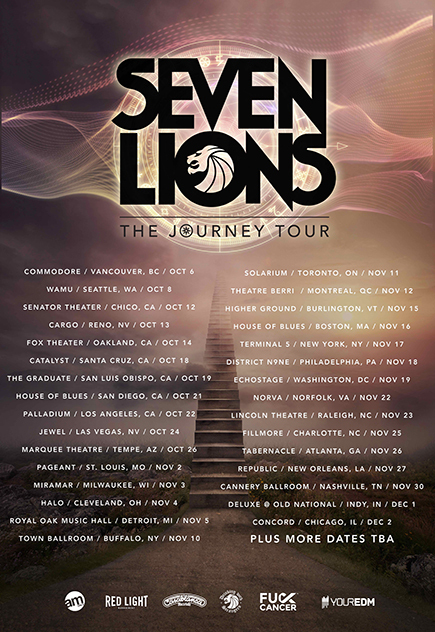 Seven Lions' Atlanta show at the Tabernacle is part of a North American tour with more than 40 dates kicking off 6 October in Vancouver, BC. The concept for The Journey tour was inspired by the millions of young people who are taking it upon themselves to create their own adventures and embark on their own personal journeys of discovery. Continuing Seven Lions’ tradition of transcending musical boundaries and creating thematic artistic works, The Journey tour harps on this youthful energy and celebrates the unique beauty found in all of the people and places that comprise the life journey we all find ourselves on. A pre-sale for the tour will run 13 - 14 July via Ticketmaster, with pre-sale purchasers receiving an exclusive download of the “Creation EP Remixes” before the official 22 July release on Casablanca Records. The package includes several reworks of the producer’s latest tracks “Creation ft. Vok” and “Coming Home ft. Mike Mains” from various producers including Kap Slap, Jason Ross and 3LAU. General on sale for the tour begins Friday, 15 July.